With artificial intelligence (AI) transforming into a ubiquitous tech buzzword in the past couple of years, Montreal has emerged as a leading AI hub in Canada and globally. The announcement from Facebook in September that McGill professor Dr. Joelle Pineau would be leading Facebook’s fourth Artificial Intelligence Research Lab (FAIR) (and first research and development investment in Canada) set off a domino effect of similar announcements from Samsung, Stradigi, and RBC Borealis AI. AI-powerhouse Element AI, which raised a historic a historic $137.5 million Series A last summer and announced the opening of a new AI lab in London, England in January, has compiled a report and analysis of the global supply of AI researchers in an effort to better understand the high-demand industry. Despite the fact that AI has become a general-purpose technology with demand only continuing to grow, very little was previously know about the talent pool that supplies the necessary algorithms. 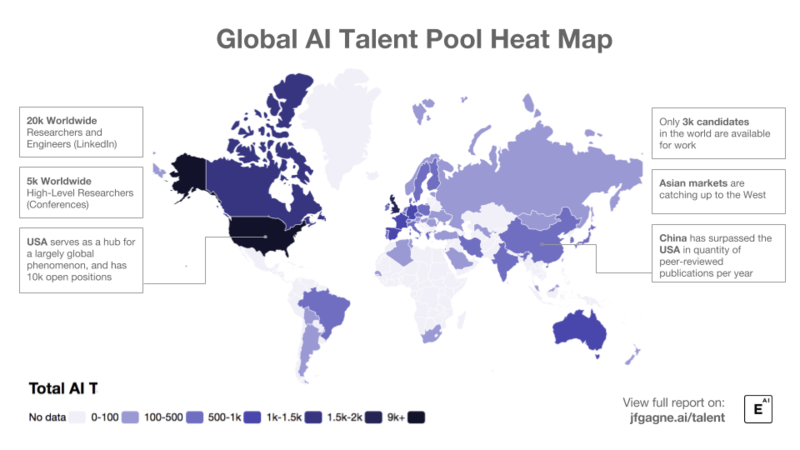 In fact, the tiny size of the available pool of talent is actually holding back the AI wave, which could be much larger. Overall, the report found that there are 22,064 PhD-educated researchers in the world capable of working in AI research and applications. However, only 3,074 of those candidates are currently looking for work. The US has the highest concentration of researchers at 9,010 researchers, followed by the UK with 1,861. Canada took third place with 1,154 researchers. Previous estimates have ranged from 1,000 to 300,000 researchers globally, depending on the definition of talent. The 300,000 number from a report by Tencent, includes the entire technical teams working on AI projects, whereas the 1,000 number counts elite researchers who have the 10+ years of experience necessary to lead major AI research efforts. Element AI’s report looked at another significant group: those who serve as the critical link between science and application. That includes the engineers and researchers needed to develop the applications made possible by breakthroughs in AI technology. A truly qualified AI expert needs to have skills and experience that allow them to effectively mediate the constraints of science, business, and industrial-grade software as well as the technical competence. Element AI’s original finding of 10,000 global AI researchers didn’t take into account AI experts operating outside the field of academia. In the last ten years, however, AI technology has shifted from academia into the private sector, where it is being used to solve real-world problems. To account for this shift, Element AI broadened its LinkedIn search to include people who have the needed skill set within their resumes, as well as a PhD in any field. This broader measure gave the total of about 22,000 profiles, only 3,000 of which say they are currently open to new opportunities. Demand is certainly still far ahead of supply. There are a projected 10,000 openings for AI development in the US alone. The Canadian government has responded to the demand for AI as well. In March of last year the Quebec Minister of Finance Carlos Leitão tabled the government of Quebec’s 2017 budget. Among the key measures is an allotment of $100 million to create an artificial intelligence super-cluster and $8 million for immediate action to support entrepreneurship. Other allocations include $15 million to capitalize the RV Orbite Montréal fund and $7.5 million to increase the capitalization of the Fonds InnovExport. SCALE.AI, the supply chain supercluster headquartered in Montreal, was also recently selected by the Canadian government part of its $950 million supercluster initiative. Click here to view the full report, and here to read a blog post providing further context and summary.